Ruislip Lido has to be one of the most idyllic work locations you could imagine. Our purpose-built Café is adjacent to a lake surrounded by woodland. There is no traffic noise or fumes and on fine days you will often be treated to a spectacular sunset across the water. The park can be reached by road and public transport and is a magnet for both local residents and those from further afield. We're on the lookout for versatile part-time front-of-house and kitchen support staff to work with the friendly team in our Lakeside Café at Ruislip Lido. You should be presentable and for front-of-house positions you should be confident and courteous dealing with the public. Previous experience working in a Café environment is preferred. These are part-time positions, working mainly at weekends, public and school holidays and other busy periods. Lunch and refreshment during the working day are provided free. Rates dependent on experience and suitability. We're looking for enthusiastic front-of-house Customer Assistants to join our Lakeside Café team at Ruislip Lido. Your primary role would be on the serving counter to serve refreshments and take food orders, but you would also be expected to help out in other areas of the Café when needed. You should be presentable, courteous and confident in dealing with the public. Previous experience working in a Café environment is desirable, but not essential as training will be given. A uniform top with logo is also provided. There are part time positions available (for weekends and holidays). No evening shifts. Lunch and refreshment during the working day are provided. Rates are dependent on experience and suitability. The full-time position is 5 days a week, Monday to Sunday (on a rota basis). The part time position is weekends, public holidays and other busy periods such as school holidays. No evening shifts. Lunch and refreshment during the working day are provided free. Rates are dependent on experience and suitability. 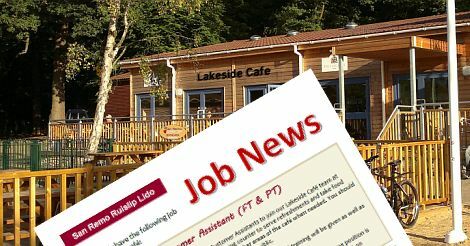 We have opportunities for versatile kitchen support staff to work with the team in our Lakeside Café at Ruislip Lido. Your duties would include clearing tables in the Café to ensure that they are clean and ready for the next customer, washing up and keeping the kitchen area clean and tidy at all times. You should be presentable and courteous dealing with the public. Previous experience working in a Café environment is preferred, but not essential as training will be given. We have a vacancy for a versatile Kitchen Assistant / Under Chef. You would be working in the kitchen at our Lakeside Café at Ruislip Lido, helping to prepare and cook snacks and dishes from our standard menu and daily specials. You would also be expected to assist with keeping the kitchen and work areas clean and tidy and ensuring that there is always clean cutlery and crockery available for customer orders. Previous experience working in a Café environment is preferred together with current food hygiene certification. Training will also be given. A uniform top with logo is provided. There are both full or part time positions available. No evening shifts. Lunch and refreshment during the working day are provided. Rates are dependent on experience and suitability. There is a full time position, 5 days a week, Monday to Sunday (on a rota basis) and a part time position working weekends, public holidays and other busy periods such as school holidays. No evening shifts. Lunch and refreshment during the working day are provided free. Rates are dependent on experience and suitability. Are you a chef / cook with experience working in a busy Café kitchen? You could be just the person we're looking for! You would be working in our kitchen in our Lakeside Café at Ruislip Lido, preparing and cooking snacks and dishes from our standard menu as well as developing and cooking daily specials. Full time positions are a 5 day week, Monday to Sunday on a rota basis. Part-time positions are working mainly at weekends, public and school holidays and other busy periods. Rates dependent on experience and suitability. Please note that you must have the right to live and work in the UK and that references may be requested and taken up. Applicants must be at least 16 years of age for part-time roles, 18 for full-time positions and should have a good command of spoken English. Customer facing roles require fluency.